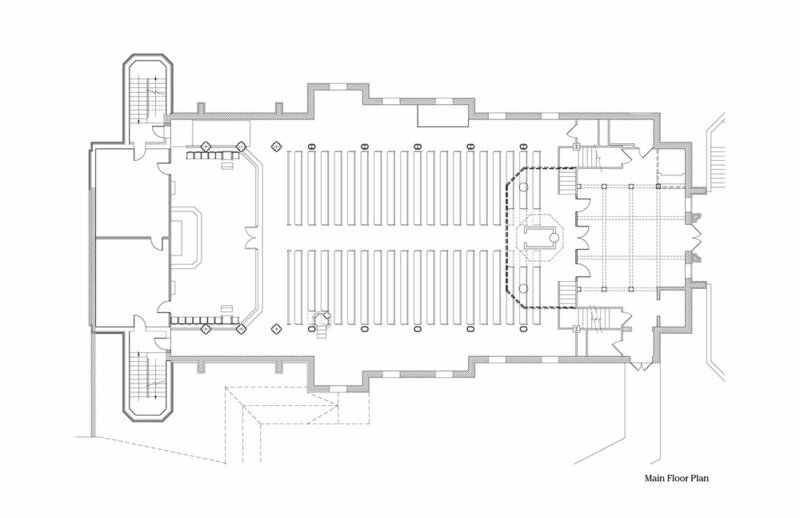 This design extends the existing choir loft approximately 10 feet, creating space for fifty singers. The narthex is enlarged and set apart with exposed beams (no drop ceiling) and columns that immediately draw attention to the east end of the church. Below the choir extension is space for a new baptismal font, suitable for adult baptisms. On the east (altar) end, the columns are extended the full length of the church. The HVAC ducts are removed, allowing the altar to move back several feet, creating additional space. The existing stairwell is pushed out, allowing for two 400 square foot sacristies, one for the altar guild and one for the clergy. An additional stairwell is created, now giving three points of entry/exit instead of the current two. The primary change to the exterior is a new door for the church and a bell tower. The baptistry includes new wood paneling, a space for the Paschal Candle and Holy Oils, and a custom font that allows for adult baptism. Looking toward the west end, the four small columns supporting the choir have been reduced to two more substantial columns. There is a new iron railing for the choir loft. The nave has new lighting and quarrycast columns and blind arcading. The east end sees a new custom altar and altarpiece. The proposed altar is a triptych, with panels that are closed during Lent. Cram and Ferguson have artist contacts in Sienna who could paint the panels according to our needs. The single circular window is replaced by three windows and a stencil pattern. There is a new altar for the side chapel. The chapel doors are in dire need of replacing. The architects created a traditional and bold door that would also match a new door to the main church. This door keeps the original color and enlarges the hinges with a traditional English design.